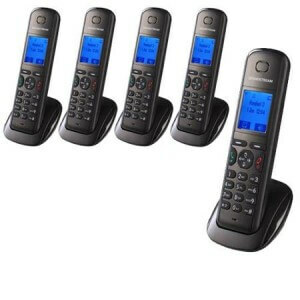 Grandstream DP710 Coming without the base station.This Dect Handset supports all IP systems on the market.You can add up to 4 handsets Grandstream DP710 Dubai over the base Grandstream DP715 and and cover your entire enterprise. It is distinguished by its excellent voice quality, many features, quality / very competitive price and wide coverage on radio frequencies, providing users with the benefits of mobility and VoIP for minimum investment. This cordless DECT IP phone comes with a charging station. To connect DP710 to the base station of DP715, DECT is used and to charge DP710, we dock it with the charging station. You can enjoy an incredible 10 hours of talk time while, on standby, your DP710 can pass 80 hours. As far as the deployment or installation of the handset is considered, it is suitable for the personal use as well as in the offices. With the SIP interoperability of this cordless IP phone, you get a loudspeaker too. The phone offers you up to 164 feet range indoor and an extended outdoor range thus solving the mobility problems and allowing the users to communicate freely in a more convenient way. We can supply Grandstream DP710 Dubai in all emirates of UAE. That is Abu Dhabi, Sharjah, Ajman, Umm Al Quwain, Ras Al Khaimah & Al Ain.